You probably know this, but I thought I’d just remind the rest of America, because they seem to be confused right now. Just the other day, I was walking through Walmart, when I saw Christmas lights and trees, ornaments and tinsel, Christmas cards and tree toppers everywhere. Then, JC Penny informed me via email that it was time to start stuffing my (imaginary) children’s stockings. And next thing I know, I’m listening to an advertisement for the Christmas Radio on Pandora. 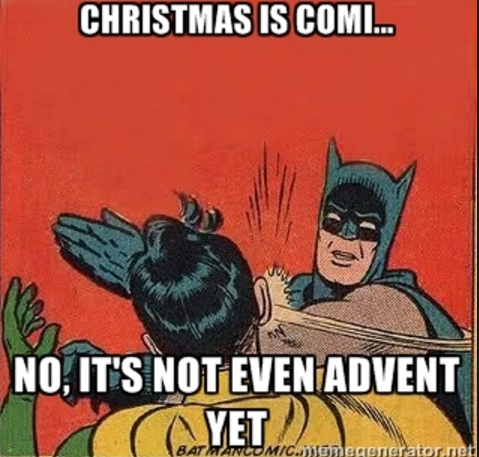 One girl told me the other day that it would be amazing to have Christmas for six months. I would die. I would crawl under the tree and cry. It would be the official Nightmare of Christmas. Don’t get me wrong… I love Christmas just as much as the next person. White lights on the tree, extended and close family everywhere, stuffed stockings, the nativity scenes, the carols, Christmas Eve church, the smell of gingerbread, etc. I’m a Christmas-enthusiast. The day after Thanksgiving, it’s time to deck the halls and have a Micheal Buble Christmas concert. Even if we are singing “I’m Dreaming of a White Christmas” in 75-degree Mississippi. But I do NOT want Christmas for a whole three months, a whole one-fourth of my year, a whole 92 days. Because there is a season and time for everything. There is a season for everything, and once we indulge too much in a good thing, it loses it’s specialness. I don’t want to miss out on the specialness of Christmas. In order to fully embrace the goodness of the seasons we must enjoy them at the proper time. Do you feel good after you eat five cookies? Probably not. Do you feel satisfied when you work straight for nine days, non-stop? I’m guessing you don’t. Do you want to dress up in a formal gown every morning when you wake up? I know I don’t. Cookies are yummy. Work is satisfying. Formal gowns are fun. But when we over-do these great things, they lose their luster. Humanity seems to think that joy only awaits us in the feast, but there is so much to bask in during the fast. The fast is a time of pruning. It’s the part where we grow. The fast is when we learn more about ourselves and about God. The fast is where God is faithful, even when the days seem dull. The fast is when the mundane routines are comforting, calling us to practical service. The fast is when we experience God in our day-to-day lives, growing closer to Him with every desperate prayer and plea. The fast is just as intimate as the feast. We can’t enjoy the fast without the feast, and we can’t enjoy the feast without the fast. So, to America, and other eager Christmasers, thank you for your enthusiasm. I really do love it! I love a soul that’s ready to celebrate our Jesus coming to redeem us. I also am super excited to celebrate Christ’s birth with the rest of the world. But I am also very content in this season of fasting. And I invite you also not to miss the magic of the fasting. Or you just might miss out on the feast.